Earlier this year I experienced my first two live Chikara shows, "Hot Off the Griddle" and "The Contaminated Cowl." Many of the wrestlers on the roster have larger than life personas. Their costumes are as bold as their characters. I've written about many of them, and will continue to do so. One of the wrestlers on the shows who stood out to me was UltraMantis Black. He describes himself as "devious" and often teams with Hallowicked. Chad blogged about him last year in our Boo series. Click this link for that writeup. Black has been with Chikara since the company launched more than ten years ago. I find that impressive, and shows me he has incredible staying power. I know times weren't always great for Chikara, but to have the tenacity to stick around and help build the company into the success it is today says something to me. Another unique aspect of UltraMantis Black is his mask. Many of the wrestlers in Chikara have unique masks. He looks like a praying mantis, much like the Colony masks emulate what you'd expect an ant to look like. I think that's part of the attraction to the company. It's not a bunch of cookie cutter stars. Black wears the same basic design of mask, but he has many different colors. Many of them have significant meaning to tie in with the storyline. Besides his outstanding work in the ring, the thing that stood out to me the most about Black is his tattoos. His arms are covered in them. With a name like devious used to describe him and his relationships with the Batiri, Hallowicked, and Delirious; you might expect demons, ghosts, and other demonic creatures as his body art. 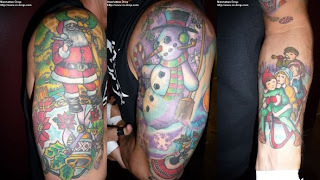 Instead Black has lots of Christmas ink. By far they are the coolest tattoos I've seen on a wrestler. If he happens to read this, I would really love the chance to get more in depth about the meaning of the tats. The artwork is fantastic, and being a big fan of Christmas myself, I love what he's done. So, Mr. Black, if you would be willing to answer some questions for the blog, email me sometime my address is right here. 2012 has been a good year for the man under the mask. UltraMantis Black and his teammates in the Spectral Envoy, Hallowicked and Frightmare (who Chad also blogged about last year, click here for that) won the presitgious King of Trios tournament, defeating four talented trios teams along the way. He and Hallowicked are also in good standings in the tag team ranks of Chikara, and have earned the right to face the Campenatos de Parejas. I've barely scratched the surface with UltraMantis Black, but like I mentioned earlier, I'm still kinda new to Chikara. But the bottom line is, I enjoy what he does in the ring and think he helps define the significance of Chikara Pro in the indie scene and beyond. He has a website too, check it out sometime by clicking here.